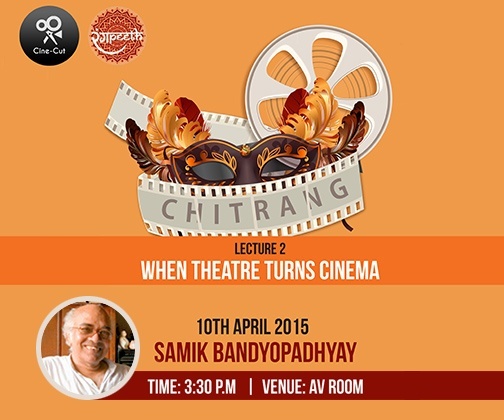 A lecture by Prof. Samik Bandyopadhyay, an eminent Kolkata based critic of the arts, theatre and film was held on 10th April,2015 at the Kolkata campus. A part of the member body of Central Board of Film Certification and Vice Chairman of National School of Drama, he is a Founder-Editor of THEMA and is a monumental figure in the school of theatre and cinema. He has lectured extensively in USA, Sri lanka, Bangladesh and England, discovering and elaborating on various facets of Indian cinema. He has been lately contributing to the industry as the visiting faculty at School of Arts and Aesthetics, JNU, New Delhi and ICCR Chair at the Department of Theatre Studies, Freie Universitat, Berlin.